A series of everyday adventures add up to a heartwarming portrait with vintage charm. 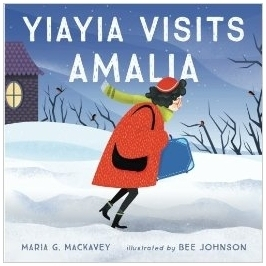 Maria G. Mackavey’s second book, Yiayia Visits Amalia, follows a grandmother’s trip from a pine-laden hillside to a busy metropolis. Bee Johnson’s spirited illustrations bring the focus on transportation to life. The story begins in Yiayia’s kitchen as she readies herself. She drives her Volkswagen to the train station, where she buys a ticket. After losing her suitcase on the train and later reclaiming it, she rides a taxi to Amalia’s apartment, and the story concludes at Amalia’s door. The uncomplicated plot provides enough innocent drama to captivate preschoolers, while offering richer topics to contemplate, such as the kindness of strangers and the rewards found in waiting. The latter is skillfully reinforced by repetition: Yiayia waits at the start for a pet sitter, in stalled traffic, and on the train. Distinctly contemporary touches, such as cell phone photos and a Post-it note, add familiarity to an otherwise classic version of New York. Illustrations delight with their wide-ranging inspirations. The facade of an apartment building echoes Ezra Jack Keats’s neighborhoods. Jaunty lines in yellow kitchenware recall midcentury advertising. In another scene, the sign on Penn Station appears in prominent letters that mimic 1930s travel posters. Background passersby, shown in orange silhouette, add depth to the ticket-buying scene. Attention to detail is outstanding: Yiayia’s scarf sometimes repositions itself to suggest movement, birds in the countryside vanish once the train journey is well underway, and the flecked pattern on Yiayia’s coat adds texture to cleanly designed art. Two-page spreads highlight the thoughtful link between words and images. When Yiayia is caught “between a dump truck and a yellow school bus,” she hunches over her steering wheel. The angular bed of the truck draws the eye with its rooflike dominance, and a bus with shadowed windows imposes from the left. Two birds on a telephone wire provide a sense of scale. Another scene depicts Yiayia being “swallowed up in a crowd of people.” Here, her face is slightly upturned as if in bewilderment. The artist’s interpretations lift the straightforward work. A handful of richer details, such as the “iris blue sky,” would further elevate the work. This will be a welcome addition to children’s literature collections. In Yiayia Visits Amalia, a series of everyday adventures add up to a heartwarming portrait. Vintage charm, smart typography, a gorgeous palette, and a winter travel theme create a timely gift for the holidays.